When you decide that you want to grow your wealth and take life to the next level, it helps to turn to an expert. To model the best and benefit from those who already know what works. Tony Robbins started with next to nothing, but he knew this method of “modeling” was the path to success. From the start (and still today) Tony got a coach – someone to push him to be his best and help turn goals into reality. 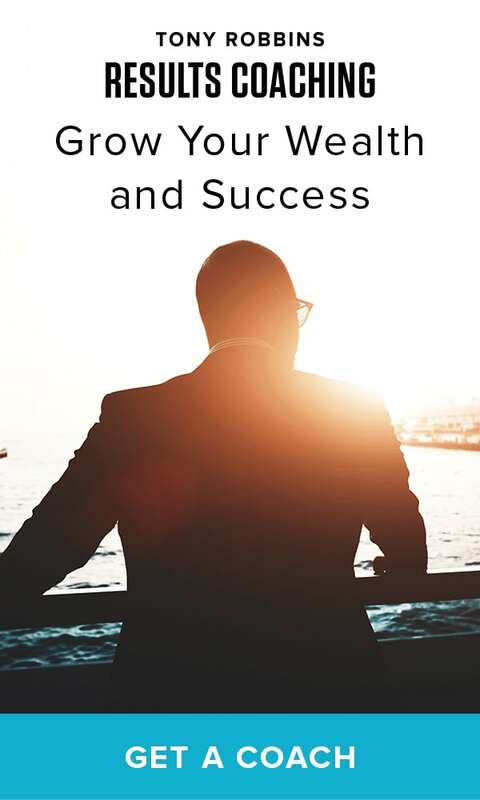 With the help of his coaches, Tony has created a multi-million-dollar empire, opened numerous thriving businesses and partnered with some of the most successful businesspeople in the world. He’s also shared his powerful strategies with others, so they, too, can achieve massive success. As a firm believer in modeling, Tony has trained all of his Results Coaches in the using the exact same strategies and methodologies that Tony himself employs in his everyday life. When you’re looking to increase your life, happiness, wealth, know that success leaves clues. People who have been successful – building happiness, businesses, fulfillment or wealth aren’t lucky; they’re doing something different. Work alongside a professional coach and access valuable strategies that will set yourself up to win. Success is 80% mindset and 20% mechanics. At the onset of your coaching experience, your Results Coach will challenge you to identify any limiting beliefs that are holding you back. Do you believe you’re unworthy of success? Are you not confident in your skills as a leader? By identifying mental blocks, you can rid yourself of these beliefs and replace them with empowering ideas to launch you toward success instead. Have you ever told yourself that you didn’t have the resources you needed to grow be successful? Think about it: was this true? It’s never a lack of resources that’s holding people back – it’s a lack of resourcefulness. Your Results Coach will empower you to stop making excuses for your lack of action, and instead show you how to move forward with what you do have. If you have the hunger to succeed, you can do so no matter how many limitations you might be facing. What’s your current plan for growing your business? How realistic is your strategy? A Results Coach will not only show you how to develop an incredible strategy, but how to implement this plan and continually optimize it. The key to achieving personal and financial growth is constantly evaluating what you’re doing to see if it’s working. You’ll also have someone by your side to keep you accountable – your Results Coach. While you will develop a close bond with your coach over time, they’re not there to be your friend. Your coach serves as a mentor and guide who will help you optimize your personal and business priorities, and check in with you to make sure you’re following through with your plans. Learning to increase wealth or generate more revenue for your business is a rigorous process. Over the course of numerous months, you’ll work alongside your coach to change your mindset and create an actionable plan. You will get the results you want, but you can’t stop there. Creating massive success in your life is ongoing if you really want to reach the top of your game and stay there. Are you ready to take your life to the next level? Generate unparalleled happiness, personal wealth or drive massive amounts of success in your business when you get a Tony Robbins Results Coach in your corner. Your Results Coach will empower you to take control of your life, grow your wealth and finally turn those dreams into a rewarding reality. Ready to get started? Schedule a free 30-minute introductory session with a Results Coach today.